We care about respect for the environment and people’s health. 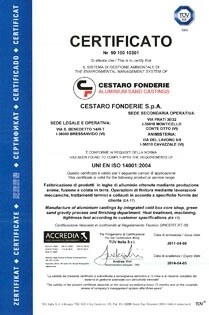 Preventing pollution, protecting the environment and safeguarding the safety and health of people are priority commitments that CESTARO FONDERIE spa has always pursued and that it intends to confirm and demonstrate through the adherence to an Environmental Management System that meets, as a minimum standard reference, the requirements of the ISO 14001 standard. 1. Keep constantly under control its environmental aspects (correlated with emissions into the atmosphere, water discharges, waste, noise, exposure of workers to risk factors, use of resources etc.) in compliance with current legislation and applicable environmental standards. 2. To continuously improve the environmental impact of our activities and the efficiency of the use of natural resources. 3. Prevent and reduce the pollution of water, air, soil and subsoil, as well as possible accidents / emergencies, favoring environmentally friendly and economically feasible technologies (BAT – Best Available Technologies – Best Available Technologies). 4. Guarantee as much as possible the recoverability and recyclability of its products, by-products and waste in compliance with applicable laws and applicable agreements. 5. Plan and constantly evaluate, with quantitative methods whenever possible, the projects to achieve the objectives of environmental improvement. 6. To allocate adequate and qualified instrumental, human and economic resources for the achievement of the determined objectives. 7. Supporting employees with appropriate training and support for their activities, providing adequate safety and emergency equipment. 8. Involve and sensitize all staff on environmental issues related to the company’s activities, ensuring the awareness and participation of all, each for their own skills, attributions and operations. 9. To seek a transparent and collaborative dialogue with public authorities, customers, suppliers and stakeholders in the territory, and make their objectives, results and environmental policy available. 10. Collaboration with our suppliers and their customers to encourage them to meet our standards and improve their environmental impacts.